Libourne's Hotel : The Libourne hotels in video. Book your accomodation. To book a Hotel Libourne. 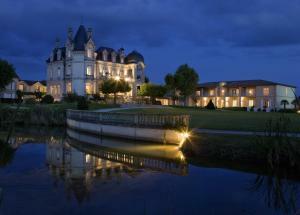 Located near the Dordogne, Château Grand Barrail dating from the nineteenth century is 3 km from Saint-Émilion. It offers an outdoor pool, a spa and soundproofed rooms with free Wi-Fi. 16th century, the Château Fleur de Roques has an outdoor pool, a billiard room and a garden with a terrace. The rooms are individually decorated are decorated with antique furniture. Each is equipped with a double bed and flat screen TV. Located in the heart of Saint-Émilion, this old stone monastery surrounded by a terrace and a garden offers spacious rooms decorated in a classic style. Wi-Fi is available throughout the property. Courtebotte Castle offers panoramic views of the Dordogne River and an outdoor heated pool and secure in a landscaped garden. The rooms are equipped with free Wi-Fi, have wooden floors and are individually decorated. Mercure Libourne Saint-Emilion welcomes you throughout the year for your business trip or holiday. It is located in the city center, beside the Dordogne. All the hotels detailed with video presentation, (Libourne hotel, booking hotel, book hotel Libourne, lodging, accomodation, hotel, Libourne, deals, cheap, discount), wine hillsides, arveyres, les billaux, cadarsac, izon, lalande-de-pomerol, saint-emilion, saint-sulpice-de-faleyrens, vayres. Add your lodging to our guide of the good accomodation of Libourne. This guide invite you to discover in pictures and videos the hotels of Libourne in the wine hillsides. To find a luxuary or a cheap, here is our selection and our partners in Gironde.